Publishers and participants of the Google AdSense advertisement program can conveniently log in to their AdSense account via the AdSense site to check their daily income, page impressions, clicks, page CTR, eCPM, etc. Alternately publishers can use desktop application to check their Google AdSense account. Apart from that, Shock AdSense is another freeware utility which can generate reports like the AdSense site. This desktop application will notify publishers of their daily revenue, page impressions, CTR and other related information in analysis format. 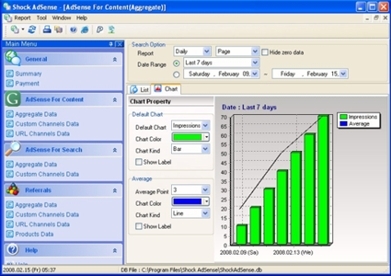 For instance, it compiles AdSense data from users’ account and presents it to users in colorful graph format for easy analysis. Shock AdSense carries a rating of 4 of 5 on the RateItAll Rating List of 24 Freeware Utilities for AdSense. Users can download this utility via the link below. Users who want to install it in the system can also try the portable version and opt to run it from any external USB device without installation. Download Shock AdSense via the link here.